Our point-to-point, net downhill course has remained unchanged forover 33years, providing over 100,000 runners of all speeds–from first-timers to the fastest of the fast–the best chance to achieve their marathon goals. The CIM is certified and sanctioned by USATF and is a Boston Marthon and US Olympic Trials Marathon qualifier. The CIM is put on by the Sacramento Running Association, a nonprofit organization. 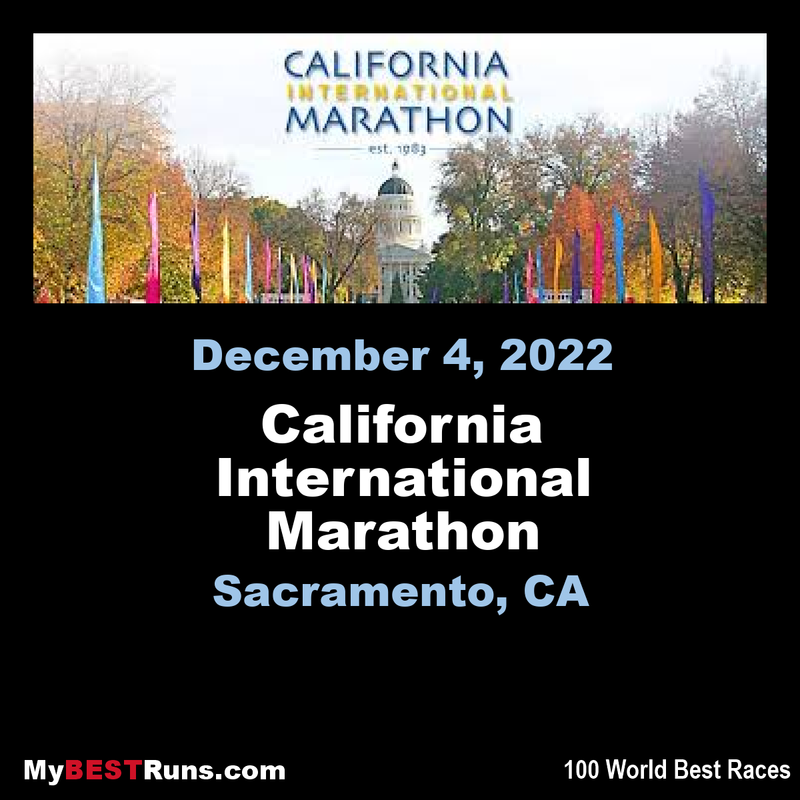 The same route SRA management created for the 1983 inaugural CIM will take you through rural countryside, then through the towns of Orangevale, Citrus Heights, Fair Oaks and Carmichael and finally, under a canopy of trees in full fall colors, into the city of Sacramento for the State Capitol finish. Even though the course has remained the same, the race has grown into a true international event. CIM has a gently rolling, point-to-point, net downhill course with well maintained streets and few turns. 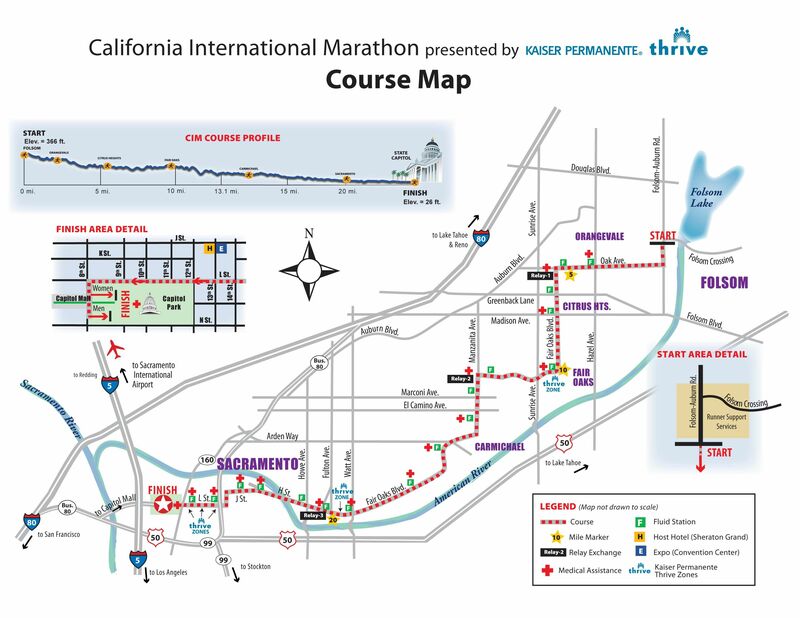 The CIM start is at a 366 ft. elevation and its finish at a 26 ft. elevation. 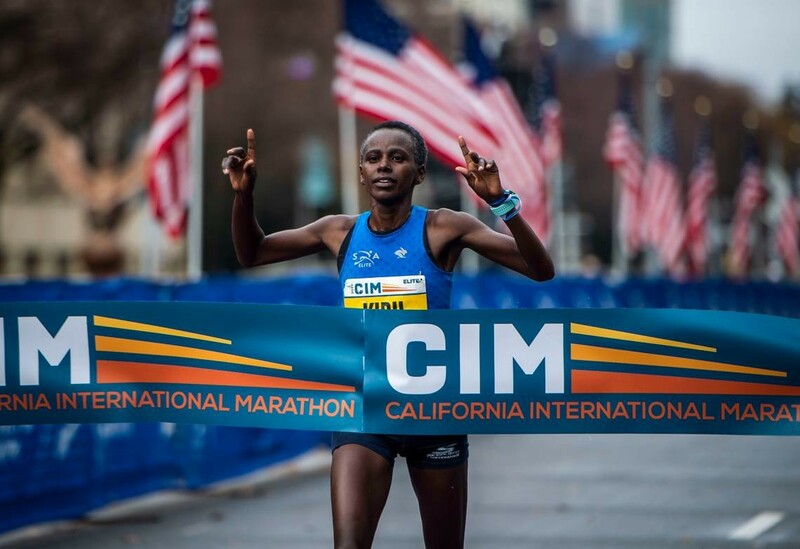 CIM has steadily grown in numbers from a field of 1,600 runners in 1983 to a race that now fills to a capacity of more than 9,000 marathoners. Over the years, the SRA has added a four-person relay (over 1,000 teams now compete) and a 2.62-mile maraFUNrun held in the spirit of fitness and fun for 2,000 participants. Both of these events are a component of SRA’s mission to expose people of all ages to the benefits of a healthy lifestyle through running. The SRA Board of Directors, race management and volunteers work thousands of hours year-round to ensure that all runners have the best marathon experience possible, whether you are an experienced elite racer, mid-packer or are running for your first marathon finisher’s medallion. We look forward to seeing you in December! Have run this marathon 6 times and have never felt comfortable running in December in Sacramento. It is much too cold for me at the start. My muscles do not do well in cold weather. Also, do not like the course. Prefer more rural settings with more natural environments. Exceptions to this are Boston, New York City and San Francisco marathons, where the spectators bring much energy and love. I've run this marathon twice, and they offer a relay which I've run 3 times. For the most part this course is flat & fast. The aid stations are what you should expect from a marathon, the start & finish are very well organized, and it's a small enough field of runners that you don't have a slow-down at the start in finding your pace. Weather is always a toss-up but directors can't control that. Emma Bates won the 2018 CIM in 2:28:18 to become the 2018 USATF Marathon and USATF Running Circuit champion. Brogan Austin in just his second marathon won the men's race clocking 2:12:38.